Both Picasa and flickr provide code to embed into web pages do that photos of various size can be used. Also they provide code to embed slideshows, but in the case of flickr this is flashplayer that will not work on iPhone or iPad. Often I just want the URL of the photo but often I am provided with URL of flickr or Picasa web page that contains the photo and much more information. The message or the media. My problem is not the technology but the amount of technology. I like to understand how things work but there is always something new and attractive to tempt you onto new pasture. So as my mum told me decades ages ago "It's better to do a few things well rather than a lot of things badly." Therefore I am going to concentrate on the content and not chase every new approach. To this end I will use following tools which are both basic and # powerful and standard within the IT community. A good tool for writing articles quickly in simple HTML on your iPad is the MarkDown App. This has recently been updated and now has a useful keyboard extension to make typing quicker. The excellent Help feature gets you started quickly. The resulting text can then be used as-is or copied as HTML to be included in your other editors. Great to quickly create content which you can then manipulate later. 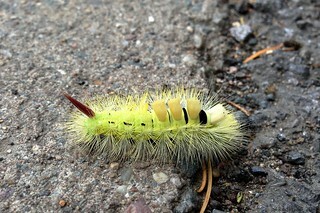 I have added image of caterpillar from my flickr account.